This week’s Top ten list is about the characters you find most annoying. The theme taht runs through most of my list is WHINER. I really dislike a whiner. 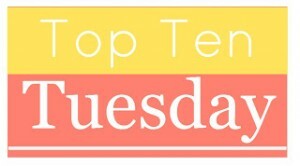 When you get done with mine head over to The Broke and the Bookish to read Bridget’s top ten most frustrating characters ever. Bella – So is it cruel of me to want to just write Bella ten times? This character is probably my all time most frustrating, annoying, and want to smack the ever loving crap out of her every time I hear her name one ever. Every romance heroine ever, just about. These girls often have no ability to solve their own life problems. Even if they do, once mister right comes along, why they just sit back and let him take care of all the heavy work, like thinking and such. Quentin Coldwater – I just want to scream at him through most of this book. “You got everything you always wanted, you prat!” I mean “I got my heart’s desire, he thought, and there my troubles began.” Really???? The Boy in The Giving Tree – I know, you LOOOOVE The Giving Tree. But see I HAAAAATE The Giving Tree. I am in the camp that he is a a selfish taker. He takes until the tree is DEAD. Great role model for young boys, Shel. Lisey – I can’t even remember now why I found her so annoying. My guess? Whiner! Melody Mayflower – I think the whole premise of this story set her up to be an annoying, shallow girl, but with no real depth, I couldn’t bring myself to read the sequel. So, I have no idea if there was growth for the character. Bridget Jones – You can take away my girl card but weight-obsessed, man-obsessed Bridget is pretty high on my ARRRRGH meter. Brida – Yawn. Spoon feed me everything. I want to learn the secrets of the universe but is is so HARD. Ma – I honestly feel badly about this. (Spoilers): She has been set up to be helpless, but as a character who is so strong in the confines of the Room, how is it that she falls to pieces and leaves Jack so helpless and alone once they are rescued. Thanks, I really think that books is all about selfishness and not knowing when to say no. Ma from Room was indeed a bit frustrating. I can imagine that you put her on the list. I really struggled with that choice because she really is damaged but as a parent it is hard to see why you would not put them first always. Bella is practically a given. But you romance heroine entry cracked me up. “once mister right comes along, why they just sit back and let him take care of all the heavy work, like thinking and such.” Perfect. Sort of along the lines of Bridget, I can’t stand that shopaholic series, Rebecca annoyed me to no end. Today really was Bella bashing all around. Thanks for getting the humor of romantic entry. I do love a good snark. Yeah, I am not really in agreement with you about romance heroines. Sure some do let the guys rescue you them, but that isn’t always the case. But I definitely agree with you about the boy from The Giving Tree. These are all great!! (except I do like Bridget Jones. lol) I never thought about Cosette, but I can definitely see how she fits the bill! Those are some good choices that I hadn’t considered – for the books I’ve read I definitely see your point! Thanks for stopping by, happy Tuesday! Seriously, the boy in the Giving Tree is such a jerk!! !